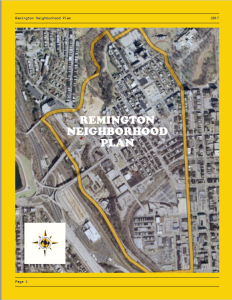 Click the Remington Neighborhood Plan cover to read the full plan, including implementation tables, updated in 2016! Read below for a history of the master plan process and current status updates. Community members worked with the Neighborhood Design Center (NDC) to create a master plan. Fourteen steering committee/volunteer team meetings and several community workshops focused on planning process, work timeframes and community outreach strategies. The steering committee worked with Remington residents, community leaders, and the NDC to document what residents liked about Remington and discuss opportunities to improve the neighborhood. Steering committee and NDC held 5 monthly planning sessions that were attended by residents, businesses, local non-profits, faith-based organizations and elected officials. April: First draft of the Neighborhood Master Plan was presented to the Remington community. Residents and other stakeholders were given the opportunity to submit comment during a subsequent 30-day comment period. July: Second public meeting to review the updates and allow the public to comment during a final 30-day comment period. June: Public meeting was held in June and a 30-day outreach period began to facilitate community input and improve turnout at the final July public meeting to review final updates before submission of the Neighborhood Master Plan and the Land Use Study to the Department of Planning for adoption. July: Neighborhood Master Plan and the Land Use Study were approved by the membership at the July 15 meeting. August: August Land Use Committee meeting – GRIA board members present an update on the Neighborhood Master Plan preview process underway by the Planning Department. August: GRIA August Community Meeting – GRIA board members present an update on the master plan review process and reviewed the newly-added implementation tables with the general membership. December: December Land Use Committee meeting – GRIA board members present an update on the Neighborhood Plan review process. February: GRIA February community meeting – GRIA board announces they authorized $1,000 to redesign the plan to meet Planning Department’s graphic design specifications. August: GRIA August community meeting – attendees discuss traffic calming plans for 28th and 29th Streets and the necessity to adopt the Neighborhood Master Plan in order for the City Department of Transportation to make investments in the desired infrastructure; Councilwoman Mary Pat Clarke is in attendance. Neighborhood Master Plan approved by the Baltimore City Planning Commission!! Read below for a history of the Corner Store Ordinance process. GRIA board approval and request to change zoning of 12 corner properties to C1 in Transform Baltimore zoning code. As of February 2015, Transform Baltimore had still not been adopted, so the board opted to take a more direct approach to rezone the properties while Transform worked its way through the City Council: passing an ordinance. GRIA’s board drafts ordinance to comprehensively rezone corner properties in the neighborhood from residential to B1-2. (Once Transform Baltimore passes, all B categories will be translated to equivalent C categories, with some updates – view the proposed zoning uses in the “Transform Baltimore Tables” document below). The ordinance next goes before the Baltimore City Council on October 14 at 1 pm on the 4th floor of City Hall in the Du Burns Council Chamber, 100 Holliday Street. It was unanimously approved by City Council. October 19. The ordinance goes before City Council as the “second read” to be approved before it is sent to the Mayor for her signature. Two opponents (Doug Armstrong and Romaine Johnson) filed a Petition for Judicial Review in Case No. 24-C-15-006204 in the Circuit Court challenging the validity of Ordinance 15-426. Armstrong and Johnson appeal the case to the Court of Special Appeals, meaning City Council is not allowed to act on Ordinance 15-426 until the appeal is heard. City Council members introduce Ordinance 16-0734 with the same 12 properties as in Ordinance 15-426. Once again, two opponents (Doug Armstrong and Romaine Johnson) filed a Petition for Judicial Review in Case No. 24-C-15-006204 in the Circuit Court challenging the validity of Ordinance 15-426. Judicial review hearing: On May 12, 2017, the court upheld the decision of the Baltimore City Council regarding Bill 16-0734 – the corner stores can legally operate as commercial businesses. May 17 – Doug Armstrong and Romaine Johnson filed an appeal of the decision. Transform Baltimore takes effect, rezoning the 12 corner store properties to C-1 zoning; impending appeal of the corner store ordinance is rendered moot. For anyone interested in learning more about Baltimore City’s initiative to reduce liquor stores around the city, check out CPHA’s coverage at http://www.cphabaltimore.org/2013/11/cpha-101-transform-baltimore-and-non-conforming-alcohol-outlets/. All documents have been gathered and/or created with the intention of fostering discussion on how to preserve and promote positive change in the Remington Neighborhood. All maps contain publicly available data from the U.S. Census, Maryland Department of Planning’s Maryland Property View Dataset, Baltimore City Planning Datasets and data from State of Maryland Department of Taxation and Assessment. These documents are not final and may change as new information becomes available.